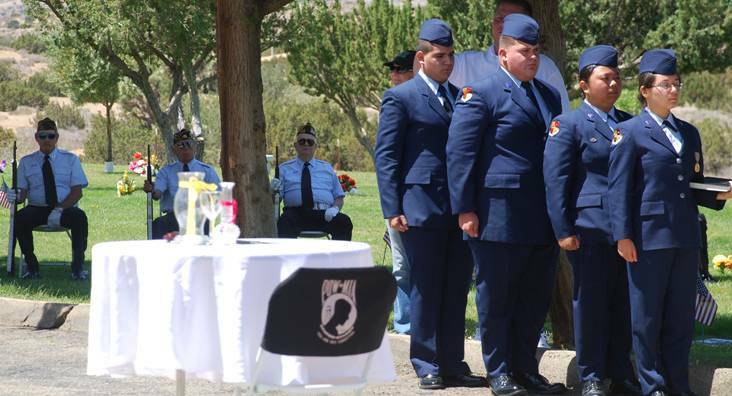 PALMDALE – The Antelope Valley Service Organization Association will hold its annual Memorial Day Ceremony at 11 a.m. Monday, May 28, at Desert Lawn Memorial Park, located at 2200 East Avenue S in Palmdale. Palmdale Mayor Jim Ledford will offer welcoming remarks and introduce the dignitaries. Major Conrad Hernandez, Commander of Highland High Schools Air Force JROTC will serve as Master of Ceremonies. Local organizations participating in the Memorial Day event include Highland High School Air Force JROTC, American Legion Post 348, Elks Lodge 2027, VFW Post 3552, 348 Auxiliary, The American Legion Riders, the Blue Star Mothers of America – CA-14, and Palmdale Veterans Honor Guard. The ceremony will include the raising of the colors and Pledge of Allegiance, invocation and benediction by Margie Hernandez, National Anthem by Tiara Luke, Table of Honor Ceremony, laying of wreaths and a salute to veterans. The ceremony will conclude with taps by a member of the Palmdale Veterans Honor Guard. Immediately following the ceremony will be an observance held at the old Palmdale Cemetery, located on 20th Street East, just north of Avenue S.
For more information, please call 661-267-5611. UPDATE: There will be a limited amount of seats provided at this event, so attendees are encouraged to bring their own chairs. LANCASTER – The historic Lancaster Cemetery will host a Memorial Day ceremony at 9 a.m. Monday, May 28, at the Veterans Court of Honor, located at 111 East Lancaster Boulevard. Cadets from Joe Walker Middle School Civil Air Patrol will post the Colors led by Traci Scott, Chief of Staff, Civil Air Patrol Pacific Region. Sylvia Gaxiola will sing the National Anthem and Bishop Henry Hearns from the Living Stone Cathedral of Worship will give the invocation. Antelope Valley Blue Star Mothers and representatives from the Marine Corps League will place the military service wreaths at the flagpoles. Cemetery trustees Dave Owens, Richard Cook and Cynthia Poole will place a memorial wreath at the main flagpole. Lt. Colonel William “Flaps” Flanagan, USAF (Ret.) will be our guest speaker. Flanagan served with the 12th Tactical Reconnaissance Squadron in Vietnam. A retired United States Air Force Lieutenant Colonel, he is a 1976 graduate of the USAF Test Pilot School. He has more than 4000 flying hours with 500 hours in the B-2 and has been mission qualified in the F-4, F-111, SR-71, T-38, and C-135 aircraft, as well. In 1969, Flanagan flew 169 combat missions in the RF-4C Phantom in Southeast Asia. Flanagan was employed by the Northrop Grumman Corporation for 20 years as a flight test Weapon System Operator (WSO) on the B-2 bomber, retiring in 2007. For more information, call Antelope Valley Cemetery District Manager Dayle DeBry at 661-942-6110. 3 comments for "Palmdale, Lancaster to host annual Memorial Day ceremonies [updated]"
Guess who is always missing at the Lancaster Memorial Day Ceremony? Guess who is always at the Palmdale Memorial Day Ceremony? Rex will be where he lives-Laguna. Nice views. From his patio. He can care less about the AV except for making a buck from his BYD and solar investments. Did you read the LA Times article about BYD? What a mess. Rex loves the Commnist Chinese more than his own.